Are those the orbs you collect in the really hidden secret areas? If so, then you should do it - the reward is great. Yeah, I recommend getting all the orbs if not just for the sake of the challenges leading up to them. cheers for that guys as I felt I was done with the game but I'm glad there's a little bit more to see. Yeah, seconding this. There's one in particular, a long vertical climb of sorts if I recall correctly, and it's bloody fantastic. So I just now finished the game with all the orbs to get the second ending, not changed my mind on the game as its still great stuff! I will definitely keep an eye out for any of DrinkBox Studios' future games as well. Yup, ZJ would hate that. I just beat the long vertical climb, and actually thought it was going to be longer even before the chickens! It didn't seem that hard - all the mistakes I made were because the bloody D-Pad kept confusing up and side. The Sierra Morena one was harder. I didn't mind Sierra Morena, it just flicks between 2 states so I thought it was easy enough to plan a route through it. The bits that made you go from left to right weren't that bad for me but the part where you had to figure how to go up were, so it became a case of guessing/memorising the pattern and not platforming ability. I spent quite a while desperately Rooster Uppercut-suspending myself above a single platform, until I felt happy to make a move... or crashed into the abyss. 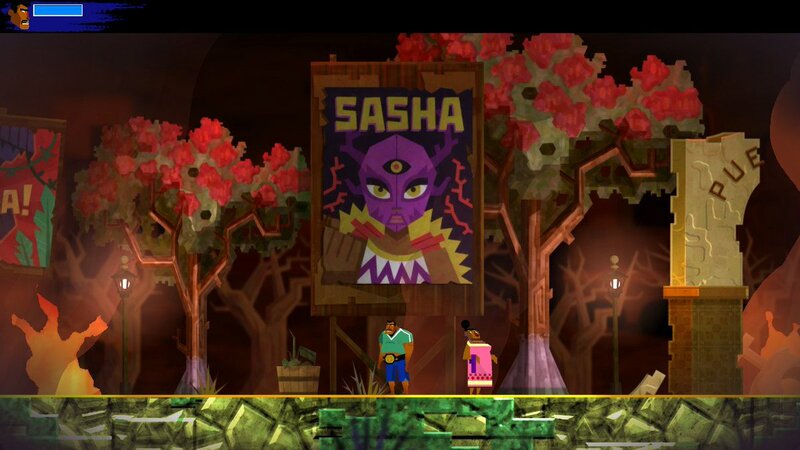 They showed there new game Severed at PSX but at the moment it's just for VITA and looks a bit like Infinity Blade but with the visual style of guacamelee. A Wii U version could work as you would use the gamepad screen to do the swipes and maybe on PS4 as well with the touchpad. I honestly didn't expect a game like that from them to be honest & I'm not sure what to make of it, seems like a stylus would be really handy for that game too. Here's some welcome news lads: both Guacamelee games are gracing Switch, and the original is out on the eShop NOW! Needless to say this, is a Very Good Thing. I got my fill of 1 on Wii U, but if you haven't picked it up on something yet, you should get right on that. Meanwhile, I'm all the way on board for the sequel! (We don't know the Switch release date of that yet, mind.) As Vita games originally, they should feel right at home on the go. Ah neat! I saw the first game on the eShop which was a pleasant surprise, but I didn't realise Switch was getting the sequel too! It's been long enough since I played it that I could warrant a double dip on the original - funnily enough, the original game's eShop description mentions double dipping, so at least they're honest! - and I've heard the sequel is more Guac goodness, so that'll no doubt be worth a look in due course. Top stuff! Yup and it's out at a time where my current backlog of games should be a lot smaller. I rated Guacameelee 1 highly in Andyman's Wii U vote last year, saying it was a "smart game that gets the tone right". I also said that "I had a really fun time playing this". So "there's yer dinner". EDIT: I should probably type something about the second one too. I'll probably get it sometime, but it'll likely depend on what other forty games have come out that week. I wouldn't rebuy Guac if you're going to play 2 soonish. It's a little too similar and I think you'd get Guac burnout. Admittedly I've played through the original like 8 times so the familiarity may not be as obvious to a more casual fan. Bloody hell! It's good, and short, but 8 times!? Also can we all appreciate the Street Fighter reference in that Switch trailer? So this is out tomorrow week. First time for anybody on Switch? Or will y'all be playing Smash instead? It'll be Smash for me, but I'll be keeping an eye on this going on sale at a later stage. Had a little Guac 2 sesh earlier today, and as Andy and others (including most reviewers) have said, it's very similar to Guac 1, but I played that maybe 3, 4 years ago? So that doesn't bother me. The combat is fun, and it plays distinctly differently from other Metroidvanias (in that it's heavily close-combat and hurling foes around, rather than shooty shooty Samus or Axiom Verge style). Also I got the "y can't guac crawl" achievement today which made me titter. It's definitely a very different beast to most other Metroidvanias (possibly Samus Returns is the closest I can think of, due to the physicality of the counter)... while being very similar to its prequel. Its prequel was belting, however, and I can't play it for the first time again! The memes are still funny, too. What with Calaca basically quoting [REDACTED] in the opening bout. Nah man, just you wait until you get to the return of the memes I was referencing. The games references throughout are excellent but the "meme" humour of the original has largely gone, and that's a good thing, apart from how they brilliantly bring it back.